What’s better than cookies and a cuppa joe on a brisk fall afternoon? Gather up your fave recipes, the ones with stains all over them — it’s time to make and bake. DIYers have an abundance of cookbooks and other resources to choose from. Bloggers show their amazing photos along with how-tos and what-ifs. Everyone, young and old, loves cookies in all shapes, flavors and textures. 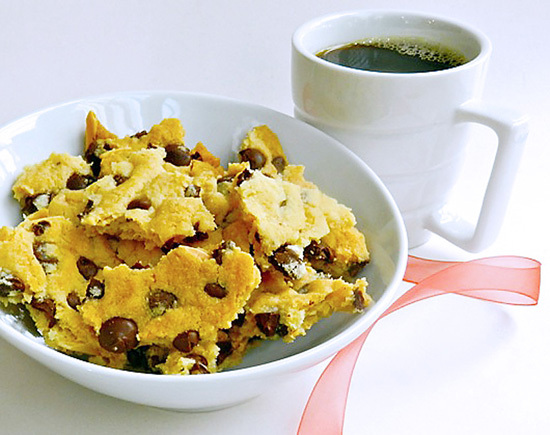 Kookie Brittle is one of my go-to cookie recipes that are mmm-mmm good! Buttery, crunchy, chocolatety — and it’s easy. Cookie giving makes a special gift that people enjoy receiving, especially during the holidays. Get creative and have fun wrapping them up. Choose from clear bags with snowflakes, brown bags with sponge-painted tree designs, Chinese takeout boxes, antique Christmas tins, or a funky plate that you found on sale after Xmas! Show off with homemade tags using Word or Illustrator, stickers, stamps and colored marking pens and Sharpies. Tie with inexpensive raffia, recycled ribbons or purchase a Costco roll of ribbon that will keep for years. Add a bag of Starbucks coffee beans, tea, or hot chocolate. Top it off with a cool mug for a special gift! In a pinch? Add a gift card. This is holiday crunch time — it’s the thought that really counts! DIRECTIONS: In a large mixing bowl, beat butter and sugar together. Add vanilla and salt. Gradually blend in flour. Mix in chocolate chips. Press evenly into jelly roll pan lined with parchment paper. Bake at 350 degrees about 25 minutes. Cool completely. Break into irregular pieces to resemble brittle. Ghirardelli is the preferred chocolate chips. I like the mix of the bittersweet and semisweet chocolates for an added dimension of flavors. For milk chocolate lovers, change it up. Don’t like nuts? Eliminate them. With December sneaking around the corner, are you up to snuff in getting your gift list pared down? Black Friday is history! Only a few Asian arts and craft shows remain for finding the unique, well-made and priced-right gifts. Here’s one that is certainly different than the rest. It’s the holiday doubles bowling plus boutique! The So. Calif. Nikkei Bowling Association Holiday Craft Boutique Fair takes place on Saturday at Canoga Park Bowl in Winnetka, where 14 artisans will share their wares. 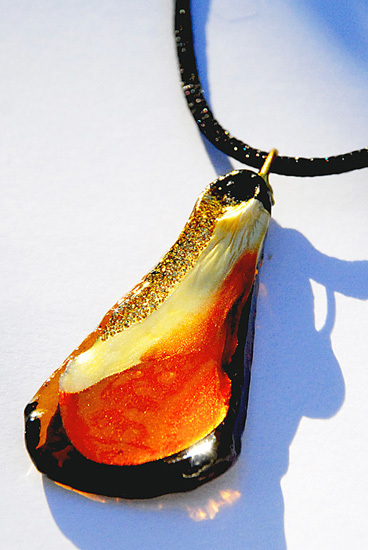 Not to be missed is the stunning stylized glass jewelry from Chris Carrillo of Exclusively Kaliki Designs. While hanging out at the beautiful beaches in Kauai, Carrillo found a lot of beach glass that settled on the sand. What to do with it? “Create something beautiful” is what ran through his mind. Hand-painted designs of turtles, lehua and cherry blossoms, sea gulls, kanji and good luck kaeru frogs on pendants and earrings on beach glass became his forte. Since he knows of no one else creating these types of pieces, his craft was learned by trial and error. It took quite a few years to refine the jewelry to his liking. On Sunday, don’t forget two more local events! Krafty Delites Christmas Boutique #2 at the Carson Community Center opens at 10 a.m. and St. Mary’s Christmas Boutique held at the Los Angeles church site starts at 11 a.m.